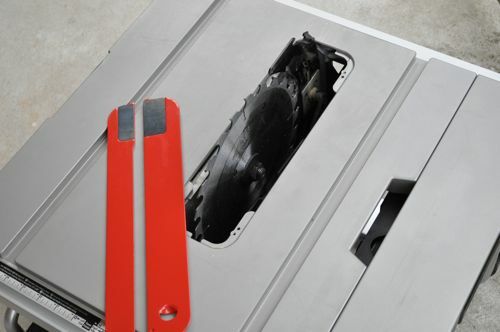 In April 2011, Bosch unveiled their new GTS1031 table saw. Designed to be compact and portable, this 10″ saw is a great choice for the job site. Bosch included some sweet features like protected on-board storage, a handle for one-handed carry and all steel “roll cage”. For these perks, you sacrifice rip capacity and a few extra pounds, and that seems a fair trade to us. We’ve been dating the GTS1031 for a few months after Bosch was generous enough to send us a test unit. More pictures can be found on our Facebook page here. Out of the box you realize this table saw is really compact. 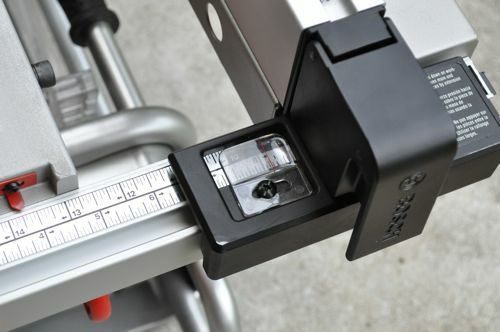 Bosch managed to fit a no-frills feature set in a 22.5” W x 22.5” D x 13” H frame. You also realize that the handle is well positioned and balanced for one-handed carry, but weaklings won’t be able to lift the 52 pounds. While it’s smaller than a comparable DeWalt, it’s also heavier. 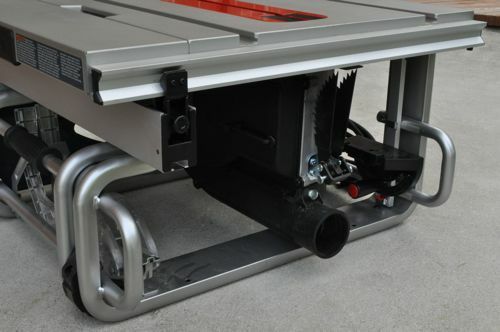 Another welcome feature is that this saw can be stored on its side making for small footprint in your shop or truck. In addition to being compact, the thing that really sets this job site saw apart is the protected storage. 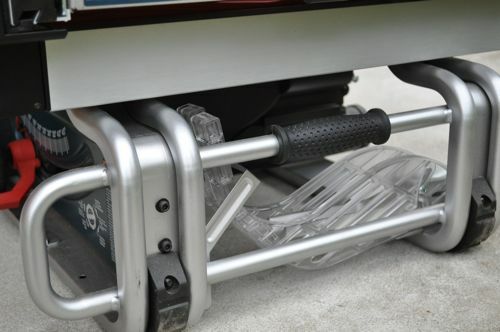 The miter gauge, push stick, safety guard, anti kickback pawls, arbor wrenches and rip fence are all stored inside the all-steel frame. As table saws are moved about, the fence is often the first thing to get damaged. 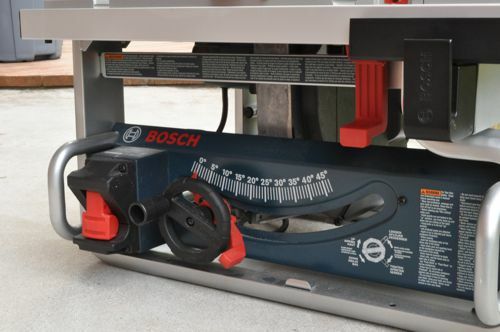 By storing the fence on the underside of the table, Bosch ensures many years of accurate cutting. Setup takes about 2 minutes after you know where everything is stored. Raise the blade all the way up, and remove the table insert. You’ll find a lever for adjusting the riving knife. Flip that lever, and extend the knife all the way taking care to align the two pins. Attach the safety guard and anti kickback pawls, and you’re off and running. Before you run off with this beauty, make sure everything is accurate. We made minor adjustments to check that everything was properly calibrated. To align the rip fence, push it right up against the blade. The fence should touch at the front and back, and the scale should read zero. Fully closed, the table pointer should read 10″. We didn’t bother with verifying the bevel, miter gauge, etc. Bosch equipped the GTS1031 with a 4hp, 5,000rpm motor that provides plenty of power, and is better than comparable models. 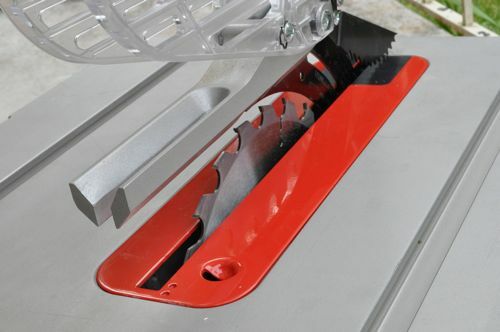 This saw can also accommodate 1/2″ dados- surprisingly, something you won’t find with all other job site table saws. Bevel adjustment runs -2° through 47°. We found the fence to be very easy to move. 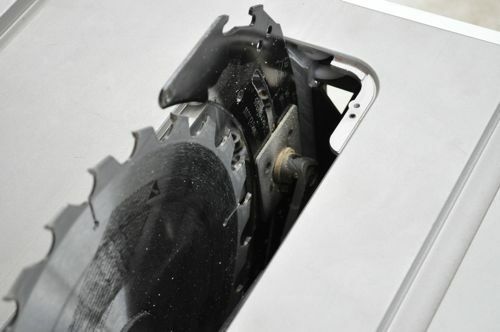 The included push-stick and 24T blade are unimpressive, and you should consider upgrading. The other downside we mentioned was the decreased rip capacity. While 18″ is better than 16″ (cough, DeWalt), it’s still short of the preferable 24″. 18″ is good but you won’t be able to cut sheet goods in half. 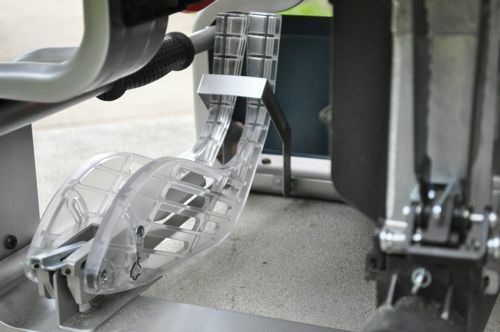 The GTS1031 can utilize a number of accessories including a dust collector, dados, zero clearance insert and stand. Keep in mind, the GTA500 table stand works exclusively with the GTS1031. 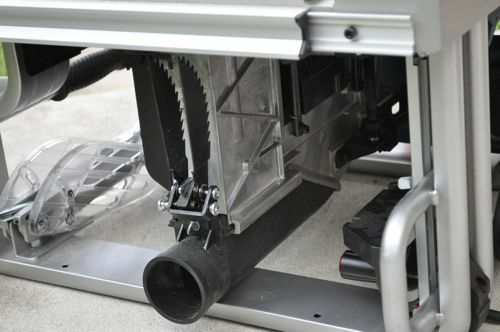 We really like this saw, and none of the drawbacks would prevent us from making a strong recommendation. Bosch worked hard to make the GTS1031 a really competitive offering. We’ve seen prices run about $370 which is a little high. Usually prices drop about 6 months out so look for a better price somewhere around October – November. Thanks for the review, Ethan. I’ve always liked Bosch’s portable table saws, particularly for their excellent Euro-style safety equipment including a real riving knife and split blade guard that are often afterthoughts on tools of this type. This smaller, less expensive, model looks like a great addition to Bosch’s line and one I’ll give serious consideration to purchasing. Hey Josh, Glad you liked the review. I really am pleased with this table saw. It took a moment to get familiar with where everything is stored. 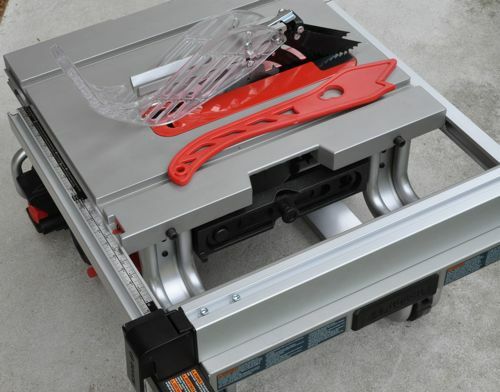 Even so, it’s a great option for a portable table saw. I like this saw for it’s power, higher rpm, but the thing I don’t like about it is it’s rip capacity. The 4100 I like for it’s rip capacity, but lower rpm. My dilemma is which of the two should I get, I know somebody who can get me a good price on them. I’m a DIYer, but I also do flooring and some cabinetry. I do have a circular saw to cut sheet goods in half. I need your advice. Thanks. 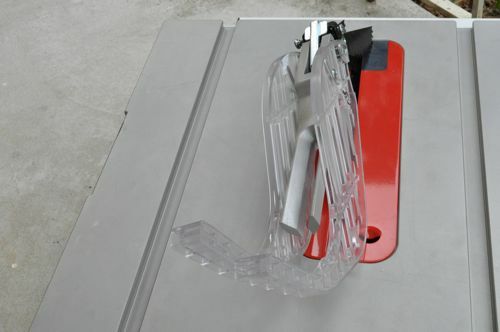 The rip capacity really is the only downside, and cutting sheet goods in half is important. If you’re cool w/ using the circ. saw from time to time- go with the 1031. It’s easy to move, quick to setup and I really liked all the protected storage. Let me know what you go with! Went with the 1031 and GTA500. Rip is a concern, but I’m comfy with using the circ to cut sheets in half. My concern is portability and storage space, at 13″ high it doesn’t take a lot of space. Will update when I get it. Thanks for the reply, btw. Got the 1031 about week and a half ago… it is easy to setup and breakdown. as for carrying it by the handle, it’s doable, I’m not a big man and I can carry this in one hand and the stand in the other with no problem. My buddy saw it and I showed him how fast it was to take down, he was very impressed. Cutting wise, no problem. I’ve changed the blade to 80 tooth and cut some 2x10x8′ with no problem. I’m quite happy with the purchase. Sweet. Yeah they market one-handed carry but people still need to remember is weighs 50 lbs. I love the saw so far too. It would be the ultimate machine if they could work out a 24″ rip capacity. I know your review is a little old but I wanted to comment. I got the Bosch 1031 for Christmas and absolutely LOVE it! Everything about it feels precise and strong. Like it will last a long long time. After using if for a while the rip size has not been a big issue. I just use my circular saw with my homemade track system. The only thing that I have been trying to get used to is the sound when it starts up. Since it’s direct drive it is loud. I have to get ear protectors. You have a great website! Thanks. Hey Harold, thanks for weighing in on the 1031. I still like the saw a lot, and if the rip capacity isn’t a problem, I highly recommend it. Thanks for commenting, and I hope to see you around OPC some more. Sign up for a Project Rewards account too. i see that handyman and i think alike, ha!